George and Sedena Cappannelli present a series of keynote talks and programs based on their books, Say Yes To Change and Authenticity and their soon to be released book, Do Not Go Gently. Say Yes To Change – Change, you bet. A lot of it! Each day we are being asked to juggle the increasingly complex demands: the cross currents of unprecedented technological development, rapidly shifting social and political structures, new roles and rules and, of course, the many other challenges and opportunities with our families, within our communities and from the desires that issue from the depths of our own hearts. Too often, this juggling act feels like it is being performed on a tight rope high above the ground. In this talks and related programs, George Cappannelli uses his 25 Keys To Making Change Work For You from his book, Say Yes To Change, to assist audiences in dealing with these challenges and opportunities of life in these times. The Art & Science Of Life Strategy - For many of us, life is series of disconnected events, experiences, challenges and opportunities. In fact, as odd as it may seem, most of us do not have a plan nor do we begin things in the beginning. Instead we jump off or in wherever we find ourselves. And who can blame us. We live in such a fast-paced, complex world. So much to do! So many demands! So little time! No wonder most of do not appear to have the time to articulate a vision, identify our goals or create a plan of action that prepares us to meet our challenges and capitalize on our opportunities. In this powerful and practical talk, George & Sedena Cappannelli provide audiences with in depth information and experience on how to apply the art and science of strategy to their lives. Ten Beliefs That May Be Limiting Your Success – Organizations and individuals may have a clear and effective strategy, a strong intention to succeed, and more than enough talent and resources to get the job done, but if they do not have the courage or willingness to examine and change some of the underlying beliefs they hold, they will not achieve their objectives. Beliefs, fundamental beliefs, are the essential ingredients that make the difference between outstanding performance and mediocrity. Keys To Making The Next Years The Best Years – Most people have spent the first half or more of their lives taking care of business, raising a family, and doing all the things that life seems to require of us, so George and Sedena Cappannelli believe that it’s time to make the next years of our lives the best years of your life. Utilizing a number of primary keys from his soon to be published book, Do Not Go Quietly, A Guide To Conscious Living and Wise Aging, George and Sedena explore ways those who wants to renew their passion for life, refine or redefine their goals can turn the predictable and the ordinary into their next great and wonderful adventure. It’s A Matter of Values – Everywhere we turn these days someone is talking – and rather heatedly we might add – about the crisis in confidence in American Business. The Dow and the Nasdaq are down one day and up the next, tugged, nudged and in some cases pushed and pummeled by a crisis of confidence. And yes, The President, Congress and some factions in the business community are waving their arms and moving their lips about change, but let’s face it most of it is the same old tired rhetoric about the same old ineffective reactive solutions. In this dynamic, honest and thought-provoking series of talks and programs, George and Sedena Cappannelli, invite audiences to explore the fact that is not a crisis of confidence brought on by a few errant corporate executives, but a crisis of values. They also invite audiences to take a bold look at how we got to this serious crossroads and what we can do about it. What Are You Going To Do With The Rest Of Your Life? - You have done your job. Raised your family. Set aside funds for your retirement. Yes, a lot of life’s daily requirements and responsibilities are now behind you. But what’s ahead of you. Travel? Time to do some of the things you could not get to when all the other pushes and pulls of the world called. These, indeed, are some of the perks of retirement. But what are you really going to do with all of these hours and days in the rest of your life? How will you find new adventures, make new discoveries and keep your passion for the next stage of your life high? 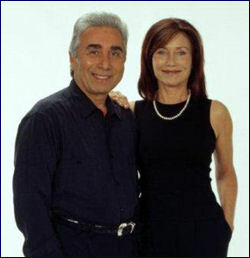 In this compelling and provocative series of talks and programs, George & Sedena Cappannelli pose some very challenging questions and offer seniors some thought provoking and life changing strategies for the rest of their lives. Learning To Live Without Life’s Three Great Illusions – Security, Safety and Control – Helen Keller once said that “security is mostly superstition. It does not occur in nature, nor do the children of men, as a whole experience it. Avoiding danger is not safer in the long run than outright exposure. Life is either a daring adventure or nothing.” In this talk and related programs George and Sedena Cappannelli takes a hard look at the illusions of security, safety and control that limit our lives and provide us with seven powerful keys to making the next stage of life a “daring adventure”. The Real Fountain Of Youth – In this provocative talk George and Sedena Cappannelli look beyond the obvious to 7 Essential Keys that will help boomers and seniors ages stay younger, healthier and happier. No magic formula, not super pill or wonder cure, the real fountain of youth lies a lot closer than most of us think and is available, free of charge, to everyone. The Inner Game of Travel – How To Re-discover The Real Spirit Of Your Journey In a world as challenging and complicated as ours having an airline that you can rely on and that understands your needs, accommodations that align with your budget and meet your standards and informed travel assistance is not just valuable, it’s essential. At the same time, even with these very necessary elements in place, having the kind of experience you want while you are traveling depends not only on these externals, but on what George & Sedena Cappannelli call the Inner Game of Travel. In this series of talks and programs George & Sedena Cappannelli, explore Six Essential things travelers can do to making travel (and life) more than a process of getting from one destination to another. Your Pathway To Life’s Greatest Destinations – How to take a great inner journey while you are traveling the world – When most of us plan a trip we pay a lot of attention to what airline and car rental company we will use, where we are going to stay, what clothes to bring and how much money we will need. Most of us do not, however, spend as much time thinking about what we can to do to ensure that the quality of our experience will be what we want. In short, we focus on the externals and not the internals. On the destination and rather than the journey itself. What if, in fact, by doing some relatively simple and easy to do things, we could make our travel experience not only remarkable and memorable, but personally satisfying, renewing and, above all, a learning experience? In these talks by George & Sedena Cappannelli audiences learn some powerful keys that will insure a great inner as well as a outer journey. The Real Journey – An Inside Out Job – Many of us spend a great deal of time looking at the world around us and hoping that eventually it will provide us with the satisfaction, fullness and adventure we seek, but the truth is, the older many of us get, the more we realize that what we seek is not found “out there”, but instead “in here.” In this wonderful and inspiring series of talks and programs, George and Sedena Cappannelli give audiences some new perspectives and some very practical and eminently usable skills to begin making the real journey of a lifetime.